Why Should I Log In to OneSearch? OneSearch features an updated, mobile-friendly library search interface that makes it easy to find, cite, save, and share books, ebooks, ejournals, articles and streaming videos. For the first time in the history of the California State University system, all 23 campus libraries are now linked in summer 2017. OneSearch is an integrated library catalog that contains records for over 29 million books in the CSU system, including those at Cal Maritime. While each library will still maintain its own collection, the physical resources in all the CSU libraries will be easily available to every student, faculty and staff. 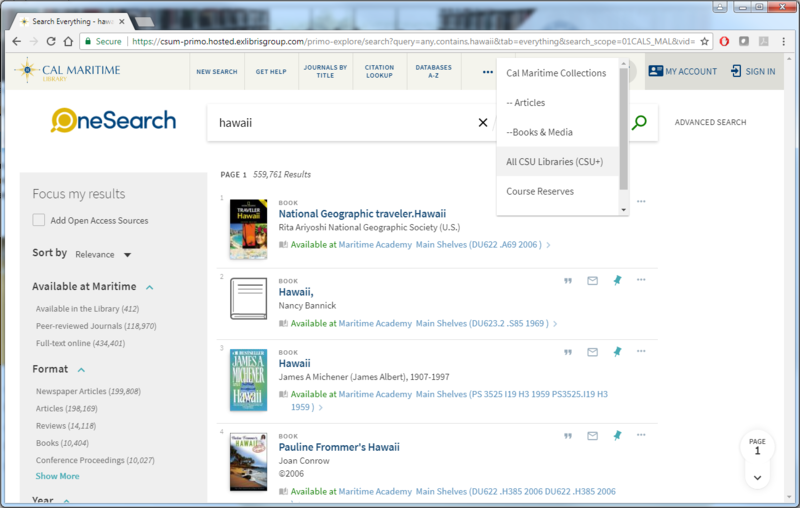 The former library catalog, course reserves, and articles search system will be replaced with a new modern discovery system, ​OneSearch,​ that will ​improve access to our electronic and print resources. OneSearch​ will be shared across all 23 campuses, allowing users to find materials that are available across institutions. Cal Maritime students, faculty and staff will be able to request library materials from any CSU library. This CSU resource sharing service​, CSU+,​ will give users access to a larger collection of academic materials. ​Requested ​items will arrive in two to five business days. Cal Maritime students, faculty and staff will have “visiting patron” privileges at other CSU libraries and will be able to check out materials with their student or employee ID. Loan periods for most items are longer than before. You can still search & use your favorite electronic databases directly within the database interface. For direct links, check our Databases A-Z list. Articles are more narrowly focused than books. To find more relevant articles, narrow down your search with more (and more specific) keywords. Use the call number to find a book in the library. Contact a librarian or ask at the Help Desk if you get stuck! Request items from other CSU libraries through CSU+. See loan periods that apply to you when viewing results. We are expanding the length of time you can borrow Cal Maritime Library materials! Faculty and staff: checkout of Cal Maritime Library main collection books is 1 year. The due date will be 1 year from the date of checkout. The new system will create new URLs. Any bookmarks or links that you have made to the former library catalog must be migrated to the new system.